The Pembroke Welsh Corgi is a devoted, athletic, affectionate, hardworking, brave and protective dog. He is bold, tenacious and vocal, and will guard his home and family at all costs. He is dependable and kind, and wants to be actively involved in the life of his family. He isn't the kind of dog who can be left alone in a backyard. He needs your companionship and attention. He is eager to please you and very easy to train, an obedient and quick learner who excels at dog sports like herding and agility. He can occasionally be stubborn and restless, but for the most part is playful, full of fun, and clownish: he will take a handful of food from you, then run away with it and throw it up in the air before eating it! He is outgoing and loves to be outdoors, to walk or jog with you, or go for romps in the woods. He craves both physical and mental stimulation. He needs a moderate amount of exercise, including a long daily walk to expend his energy and so that he doesn't become overweight. He is very friendly, polite and agreeable to visitors, though he can be wary of strangers if he doesn't learn how meet them while still young. He is a very good and alert watchdog who is quick to sound the alarm. He will bark. And then keep on barking! And keep on barking! He needs to be trained to know when it's time to stop. He gets along fine with dogs and cats he knows and has been raised with, but may chase animals he doesn't know, and if he is a male can be aggressive and territorial toward other male dogs. He will often try to boss and herd other animals. He is very good and patient with considerate children, and instinctively protective of them. He may also attempt to herd them by nipping at their heels, and must be trained not to do this. He is very high shedder, so might not be a good pet if you dislike dog-hair or vacuuming frequently. The Pembroke Welsh Corgi is 10 to 12 inches tall (to shoulders) and weighs 24 to 30 pounds. He has a double coat consisting of a medium-length outer coat and a short, thick undercoat. His coat can have two or three colors, including red, sable, fawn, black and tan, white or blue. His coat only needs an occasionally brushing but because it sheds copious amounts of hair you might find yourself brushing it daily to keep the volume of hair in your home lower. The Pembroke Welsh Corgi's origins are somewhat uncertain. He may be descended from Viking dogs of the 9th and 10th centuries, or he may have been brought to Wales in the 12th century by Flemish weavers invited to live in England by King Henry I. There they became farmers, and their dogs adapted to become herders of livestock or guard dogs. 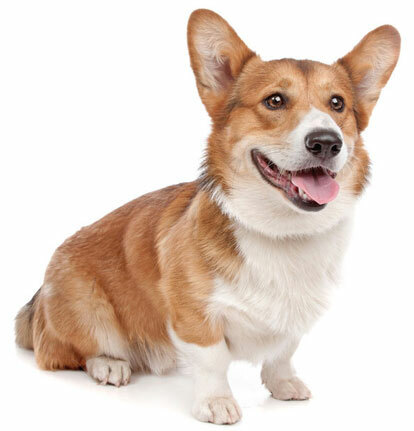 In the 19th century, Pembroke Welsh Corgis were mistakenly bred with Cardigan Welsh Corgis, but in fact these are two distinct breeds. They were separated again by the (English) United Kennel Club in 1934, and first registered with the AKC the same year. The breed has become extremely popular in the years since: Queen Elizabeth II loves Pembroke Welsh Corgis, and owns several herself. His AKC popularity was 22nd out of 157 breeds in 2007.